Alternatives To Pallets: Are They Up To The Job? Pallets aren’t the only option when it comes to shipping and storing goods – some businesses use slip sheets, while others just load and unload their products one box at a time. Each option has its advantages and disadvantages, but which comes out on top? 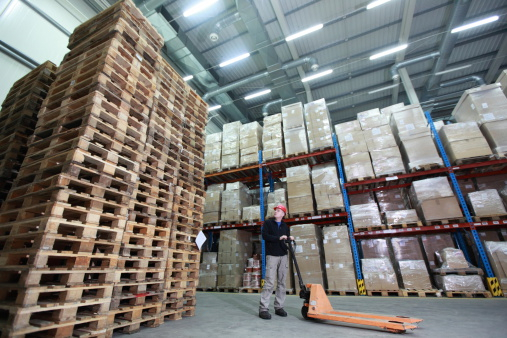 The biggest and most obvious advantage of using pallets is that they make product movement easier in manufacturing, distribution and warehousing environments. Moving product by pallet is usually faster and easier than moving them by hand, which reduces labor costs. Wood pallets are typically durable and easy to repair, providing a low cost option for either one way or closed loop applications. Pallets do have two minor disadvantages. First, they have airspace to allow for handling by forklifts and hand jacks, which is space that could otherwise be used for shipping and storing products. Second, they can be heavy, depending on what they’re made of. This is less of an issue for more expensive aluminum and plastic pallets. Wood, plastic, corrugated, and metal pallets all have their individual benefits. Aluminum pallets are an expensive option, but are great for heavy loads. Corrugated pallets are cheap and work fine with lighter loads. Wood pallets are durable and affordable for most applications. Slip sheets weigh less than pallets – particularly hardwood pallets – and are cheaper, though not by much. Slip sheets work best where space-efficient shipping is critical. They allow shippers to “cube out” a trailer – fill every cubic foot with product – which you can’t do with pallets. Slip sheets come with a couple of disadvantages. Users need to buy or rent different equipment to handle them, as standard forklifts won’t work. Slip sheets also can’t support as much weight as pallets, so they aren’t a viable option for companies that ship heavy products – say, greater than 2,000 lbs. Loading and unloading by hand is always an option. More and more companies are choosing to do this as they implement just-in-time inventory management and have fewer products to move per shipment. The floor loading option offers a couple of advantages. Shipping is more space-efficient since there is no room taken up by pallets. Floor loading also avoids the upfront cost of pallets, slip sheets and the equipment needed to move them. However, the up-front cost savings come with added costs in other areas of operation. Moving products box-by-box is labor-intensive. The cost savings from not having to pay for pallets or forklifts can be negated by the extra labor costs. These are all viable options for consideration. Still, pallets fit a wide range of budgets and load requirements, and deliver huge savings on labor costs – which is why they remain the dominant method for shipping or storing goods.